Finance Minister Yair Lapid insists in speech to American leaders that peace deal is the key to economic, political, and internal stability. 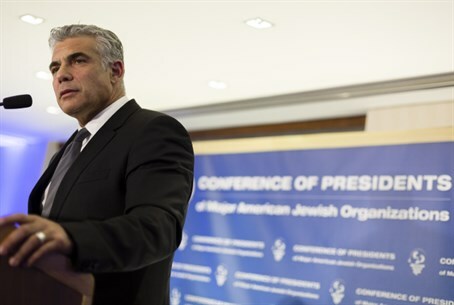 Finance Minister Yair Lapid (Yesh Atid) spoke at the Conference of Presidents of Major American Jewish Organizations Monday about the peace talks with the Palestinian Authority (PA) and the "enormous impact" the talks could have on the Israeli economy. According to Lapid, there is an "ongoing attempt to dissolve and inhibit" the peace process - and he is determined to prevent it. "If the Israeli left and the Israeli right keep saying that 'nothing will come of [the talks],' then a self-fulfilling prophecy will result and instead of approaching the talks wholeheartedly, both sides will continue to sit and gain points for the blame game that will be conducted after everything collapses," Lapid predicted. "I will not let anyone ruin the chance of an agreement," Lapid continued. "This is real, this applies now, this is not easy but we can make it happen." Lapid blamed the PA primarily for the failure in talks, but he also stressed the importance of taking responsibility for Israel's role in how events proceed. "We must make every effort to reach an agreement, because the current situation endangers Israel's future," he insisted. "It endangers us because Israel is unable to, and cannot, absorb four million Palestinians. If we want to remain a Jewish state, we must separate from them." "It is threatening us because it causes increasing damage - economic and political - in our relationship with the US and the world," he continued. "Every week that passes without progress in negotiations endangers the stability of the government." "The agenda of this coalition is very clear," Lapid said. "The Prime Minister sat down on the first day of the coalition [. . .] and said that we are going to start the peace process according to the two-state solution." "Then, he repeated that in the Knesset, he repeated that in the UN, he repeated that in the White House, he actually repeated that almost every time he saw a microphone," Lapid continued. "Yesh Atid is...a legion of 19 spears that is protecting this agenda." Lapid opined that the Israeli populace would support a peace deal if the government reached such a deal, adding that "this is a very proactive government that I think should keep working with the same partners." Asked about the PA's demands in negotiations, Lapid noted that it was agreed early on that US Secretary of State John Kerry would be the only person speaking to the media about the talks' progress. However, he did say that the PA knows full well that Israel will always refuse to yield responsibility for its security to international powers. However, Lapid has recently voiced support for Kerry’s peace plan and brushed aside security concerns that have been expressed by other Israeli officials - a move which has garnered praise from Kerry for his "bravery." Earlier this month, in a speech at the Institute for National Security Studies (INSS) in Tel Aviv, Lapid declared that if the peace talks with the PA fail, Israel’s economy will be hurt, countering recent comments by Economy Minister Naftali Bennett, who said that a Palestinian state will crush the Israeli economy. He has also previously said that Kerry’s plan would allow Israel to get a “fair divorce from the Palestinians" and has dismissed concerns that a state would pave the way for a barrage of rockets on Israel, as claimed by Defense Minister Moshe Ya'alon.